University of Hawaii Press, 9780824832117, 485pp. The 1846-1848 Mahele (division) transformed the lands of Hawai'i from a shared value into private property, but left many issues unresolved. Kauikeaouli (Kamehameha III) agreed to the Mahele, which divided all land among the mō'ī (king), the ali'i (chiefs), and the maka'āinana (commoners), in the hopes of keeping the lands in Hawaiian hands even if a foreign power claimed sovereignty over the Islands. The king's share was further divided into Government and Crown Lands, the latter managed personally by the ruler until a court decision in 1864 and a statute passed in 1865 declared that they could no longer be bought or sold by the mō'ī and should be maintained intact for future monarchs. After the illegal overthrow of the monarchy in 1893, Government and Crown Lands were joined together, and after annexation in 1898 they were managed as a public trust by the United States. At statehood in 1959, all but 373,720 acres of Government and Crown Lands were transferred to the State of Hawai'i. The legal status of Crown Lands remains controversial and misunderstood to this day. 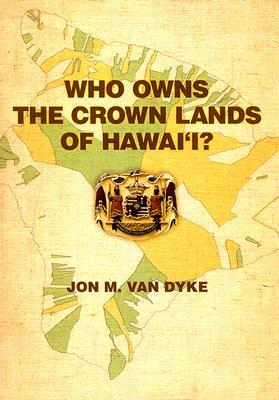 In this engrossing work, Jon Van Dyke describes and analyzes in detail the complex cultural and legal history of Hawai'i's Crown Lands. He argues that these lands must be examined as a separate entity and their unique status recognized. Government Lands were created to provide for the needs of the general population; Crown Lands were part of the personal domain of Kamehameha III and evolved into a resource designed to support the mō'ī, who in turn supported the Native Hawaiian people. The question of who owns Hawai'i's Crown Lands today is of singular importance for Native Hawaiians in their quest for recognition and sovereignty, and this volume will become a primary resource on a fundamental issue underlying Native Hawaiian birthrights.